As well as The Trustee of the Juicy Love Trust, Jihn William Webb has a string of Wicked-related companies listed on the New Zealand Companies Office site. Like any company listed in New Zealand, they have a local address for their respective registered offices. Webb’s companies’ New Zealand address is listed as a Christchurch business advisory firm [Duns Limited, Level 1, 100 Moorhouse Avenue, Addington, Christchurch, 8011 , New Zealand. Three NZ registered companies are directed by John William Webb: The Wicked Cult Ltd incorporated on 23/12/02, Wicked Ltd, incorporated on 18/07/05 and Wicked Culture Ltd incorporated on 15/07/05. He is sole director of all three and he owns Wicked Ltd. The other two are owned by Wicked NZ Holding Pty Ltd based in Queensland according to the NZ Companies Office records www.companies.govt.nz. 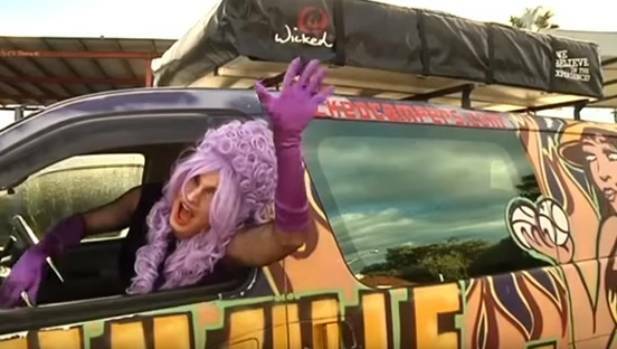 This register lists his residential address in Queensland, Australia and notes that he is a director of Outrageous Campers Pty Ltd based in Queensland. Photo (of “Leanne”) and article source.